As the equivalent field of view of a 30mm, this well-made metal-barreled lens is ideally suited for available light, day-to-day applications such as street photography, reportage and landscapes. It has 9 nine elements arranged in 7 groups and adopts three aspherical-shaped lenses to reduce distortion and spherical aberration, while Nano coating is employed for reduced ghosting and flare. Like the previous Leica-branded 42.5mm (85mm equiv.) f1.2 this new lens features an aperture collar and an internal focus mechanism (so there’s no extending barrels) with a newly developed stepper-type AF motor suited to stills and video capture. 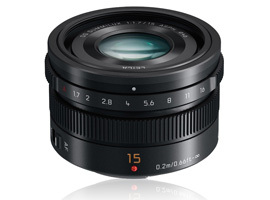 Leica purists may protest at the use of the term ‘Summilux’ to describe the model’s maximum aperture – it’s usually reserved for f1.4 lenses only, but at f1.7 this new 15mm Micro Four Thirds lens is fast while remaining compact and relatively light in weight. With a 46mm filter thread and a minimum focus distance of just 7.87” (0.2m), this model weighs in at just 4 oz (115g) and measures 36mm in length. The lens is available for pre-order at $599. 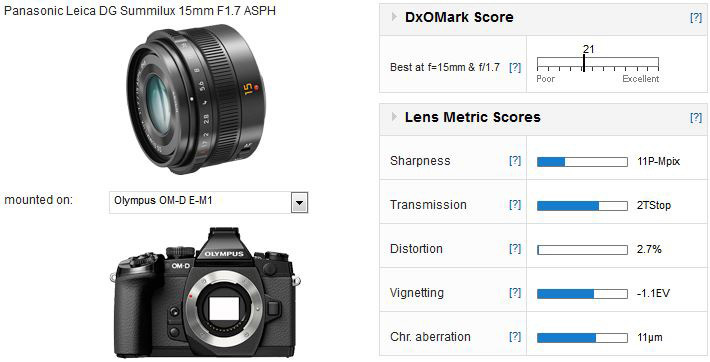 The new Panasonic Leica 15mm f1.7 achieves a DxOMark lens score of 21 points, a good score overall with very good transmission (2TStops) and high peak sharpness. Wide-open the lens is sharp in the center but even on the E-M1, a 16-MP model sans AA filter, images are somewhat softer in outer field till f2.8. Optimum performance is achieved at f4 but this lens has high-levels of barrel distortion and fairly high lateral chromatic aberration in the outer 2/3rds of the field. Keep in mind distortion and chromatic aberration are corrected when outputting JPEGs in Panasonic cameras, while the data is included in Raw files (and relies on support within the software utility for correction). Olympus cameras differ slightly however. 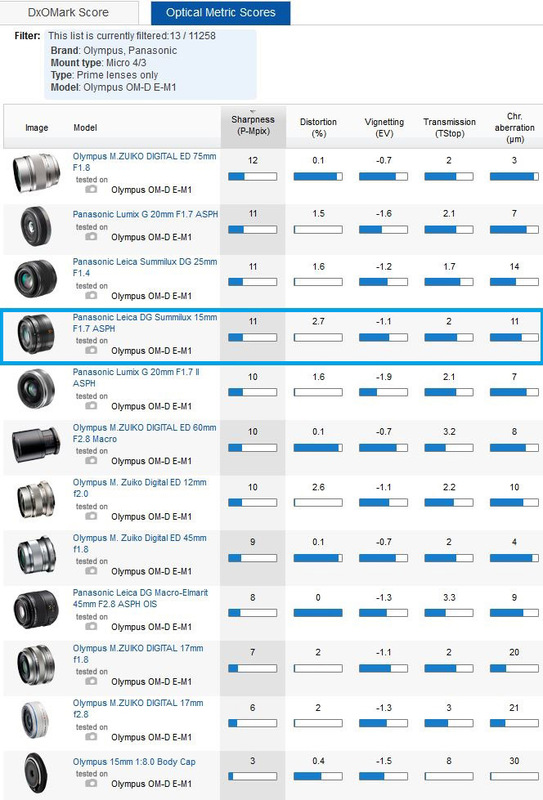 Olympus Micro Four Thirds cameras correct distortion in-camera like the Panasonics but have only added the capability to remove chromatic aberration in recent models. The Leica 15mm Summilux is one of the sharpest lenses in the Micro Four Thirds line up. Although a little wider than the Olympus M.Zuiko Digital 17mm f1.8, this model is the most likely to be considered as a rival option to the Leica. On the E-M1 the 17mm can’t match the Leica’s peak sharpness (at f4) but it does perform similarly at wider apertures – neither have particularly good uniformity until they’re closed down a stop and half (or two stops in the case of the 17mm M.Zuiko). 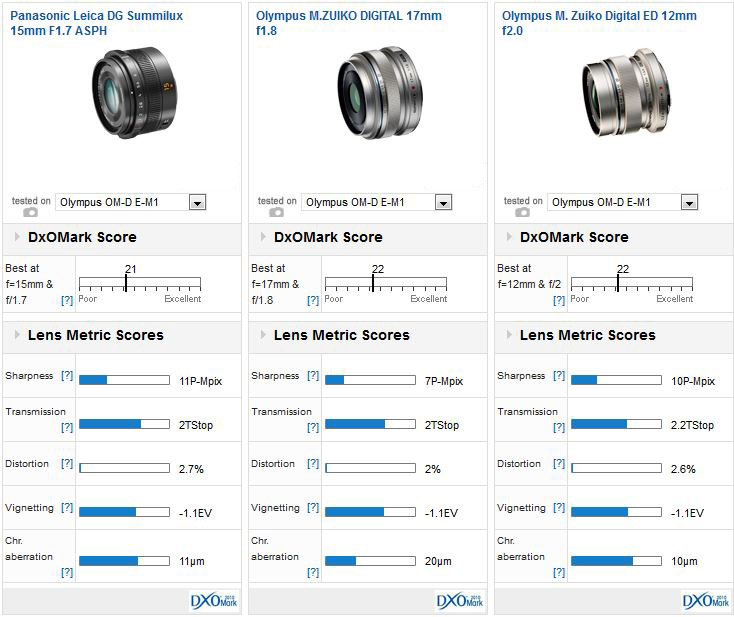 Although their control of distortion and vignetting are similar, the M.Zuiko has lower distortion but quite high levels of chromatic aberration. The Leica’s performance is also similar to the wider 12mm (24mm equivalent) M.Zuiko. However, the 12mm has slightly better performance wide-open at f2 than the Leica at f2, although it doesn’t have that model’s uniformity from f2.8 onwards with slightly softer corners at all apertures. The Olympus has similar vignetting, chromatic aberration and distortion despite the wider field of view. It’s good to see Panasonic add premium quality primes although this particularly model appears to be an odd choice of focal length falling between the conventional 24/28mm and 35mm equivalents. At $599 and bundled with a metal hood and pouch, it compares favorably in both price and performance with the 17mm f1.8 from Olympus (although $500, that model ships without any accessories). Both compromise some aspects of performance for the sake of certain practicalities but the higher peak sharpness and improved uniformity of the Leica lens is difficult to ignore.